You're probably familiar with the really big crapper that Charmin set up in Times Square for the holiday season. 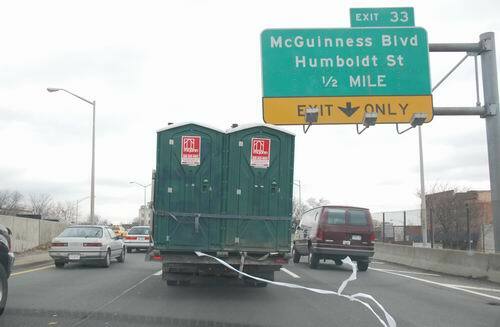 Well, we had the unique pleasure of being behind this truck carrying portable toilets on the BQE yesterday, trailing a long stream of toilet paper that seemed too rough to be Charmin. (Definitely one of those cheap institutional brands that's hard on the you-know-what.) Call it the Brooklyn/Greenpoint Toilet on the Go. Brooklyn pride, baby.